In January 1905, Ralph Vaughan Williams spent a week in and around King's Lynn in Norfolk (with a brief excursion to Sheringham, further along the coast). While there he collected almost seventy songs, from twenty singers. A number of the songs he noted on that visit had particularly fine tunes, and the composer would make use of several of these melodies in his 'Norfolk Rhapsodies' and other classical compositions (while another was put to use as a hymn tune, in The English Hymnal). This digital book had its genesis in concerts organised in 2005 to commemorate the bicentenary of Nelson's death, and the centenary of Vaughan Williams' first collecting trip to King's Lynn. The text has been written by Alan Helsdon, but it draws also on work carried out by Jill Bennett and Elizabeth James into Vaughan Williams himself, and the singers from whom he collected. If this had been a printed book, instead of on a CD-ROM, it would have run to around 100 pages. The main body of the work provides the background to RVW's visit to King's Lynn, then gives a detailed itinerary of where he went on each day, who he met, and what he collected. This has been pieced together, with a certain amount of detective work and deductive reasoning, by studying his notebooks - not just the pages now reproduced on the Full English site, but the empty (but still numbered) pages which are not shown there. Then there are various lists: an alphabetical list of all the songs included on the CD-ROM, a list of those which were included in the Journal of the Folk Song Society (a surprisingly high percentage), and a list of all the singers, and the songs they sang. This list is then hyperlinked to potted biographies of the singers, and to a page for each song. The biographies are generally short, and in a few cases researches have failed to definitively identify Vaughan Williams' singer. In another, the singer previously always referred to as 'Mr Crist' - and the source of a very fine Dream of Napoleon among others - is now revealed as Charles Robert Crisp. Given that he was a workhouse resident, so subject no doubt to a good deal of shame and indignity in his final years, it's pleasing to be able at least to have his surname correctly recorded at last. The song tunes have been transcribed (so, unlike when using the Full English archive, you don't have to try to decipher what RVW wrote!) and are provided along with a MIDI file so, if your sight-reading isn't up to much, you can hear how the tune should sound. Obviously, where a full set of words was collected, this is reproduced. But for the numerous examples where Vaughan Williams either took down none of the words, or an incomplete set, Alan Helsdon has provided a full, singable set of words. Another page, headed 'Sources', gives chapter and verse on the provenance of each set of words. 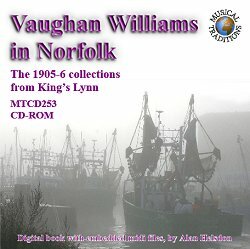 Wherever possible, missing lyrics have been sourced from Norfolk sources - Vaughan Williams' MSS, notebooks and journal articles, versions from Norfolk singers such as Harry Cox and Walter Pardon, or broadsides from the Bolingbroke Collection of Ballads and Songs, which came from a Norwich ballad-seller. There are 77 songs in all. The majority of these were collected during Vaughan Williams' first visit, 7th - 14th January 1905, but there are ten more (from five different singers, all of whom he had met on his earlier visit) noted on 1st September 1906, when he made a return visit to the King's Lynn Union and to the fishing community living in the town's North End. In addition there are four dance tunes which he noted from one of the singers, Stephen Poll, who was also a fiddler. Chris Holderness provides notes on these four tunes. Alan Helsdon and all concerned are to be congratulated on their researches. I have a couple of very minor quibbles on the presentation. It might have been nice - and probably not much more work - to hyperlink to individual songs from the alphabetical index, as well as the page where they are listed by singer. And some songs with longer texts (e.g. Mr William Harper's The Silv'ry Tide) are presented in a slightly different way, in order to try to keep the notation still visible when reading the verses at the bottom of the page. That's admirable, but with my browser settings I found that this changed (for the worse) the way the MIDI file opened. But that's no big deal, and given the wide variety of browsers and personal browser settings in use, it is notoriously difficult to produce any kind of web-based resource which will display in exactly the same way for all users. More broadly, it did occur to me a few times to ask "why is this a CD-ROM rather than a printed book?" I guess the main reason is economics. Much more viable to offer a print-on-demand CD-ROM than to produce a printed book for an unpredictable, but almost certainly quite small, audience. When I reviewed Dan Worrall's House Dance CD-ROM a few years ago I found that the digital format did offer significant benefits, since a discussion of a particular musician's playing style could link directly to a recorded example of that musician in action. Given that we have no sound recordings of the King's Lynn singers, there's less scope for that here. The main thing which this CD-ROM offers, which you wouldn't get with a book, is the presence of MIDI transcriptions of the songs. Don't get me wrong, I very much like physical books, but I'm by no means anti digital publications. And I'd far rather a work like this was made publicly available, than that it should be abandoned as financially unrealistic. It just occurred to me that, until very recently, the only way of producing something like this would have been as a printed artefact, and there are still, I'm sure, many local history projects which are being published in printed rather than digital form. But apart from this, and Musical Traditions' other digital books, I don't think I've handled a CD-ROM for years. Increasingly it seems like old technology. Personally I still have a CD drive on my computer, and I don't own a Kindle. But I wonder if the format would put off any potential purchasers? I suspect the future for digital publications lies in some kind of downloadable e-book - but which format? While commercial publishers may be able to afford to experiment with a range of alternative formats, that's not really an option for a cottage industry like MT. So, until a dominant format emerges - if it ever does - I suppose a CD-ROM is the safest option. As I say, I'd far rather have access to a publication like this, than not.